Our WWM chair massage booth renovations are complete! We are so happy with how the new booth turned out. 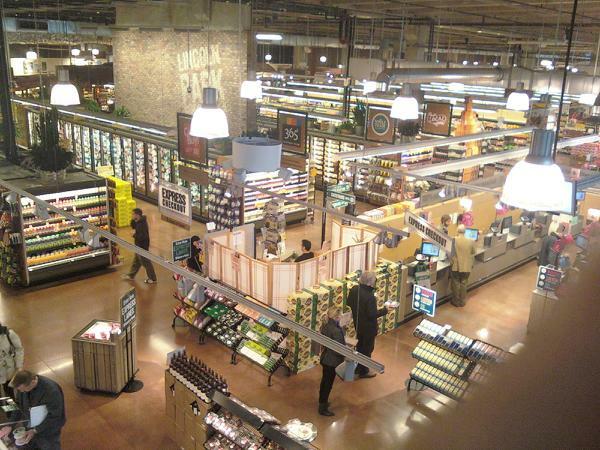 The new look nicely compliments the rest of the remodeling done in Lincoln Park’s Whole Foods Market. 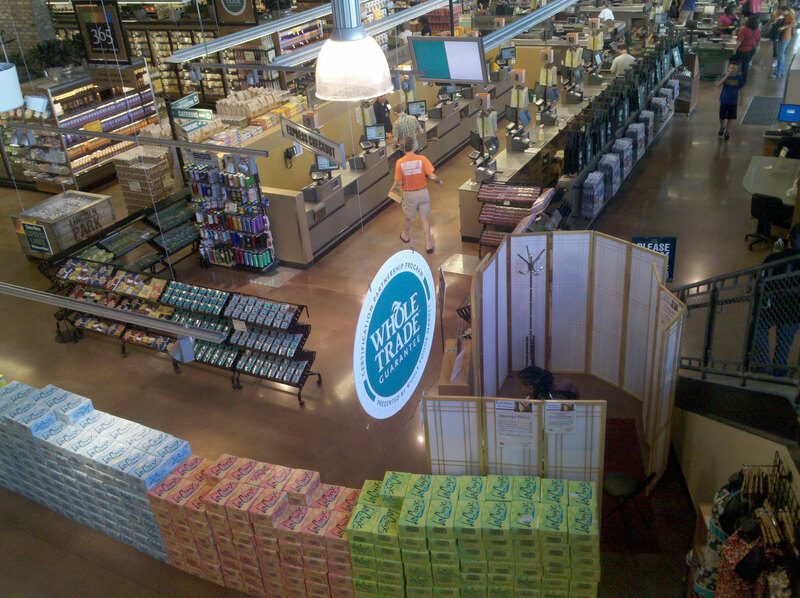 We thank Whole Foods for being such wonderful partners and for all their help with the remodel. Stop by and see us and our new booth! The new booth has privacy screens above and is much more insulated for sound and temperature than the old booth. The new booth is painted in shades of green and black to match WFM Lincoln Park’s new decor. We updated all our equipment inside the booth to match the new look! WWM chair massage booth now has a sound absorbing wall and a new black coat rack. Looking down at the booth from the stairs in a new experience with the sound barrier privacy shields above the booth. WWM chair massage booth has a new look! On Tuesday, January 31, 2017, I spent a few hours working with Najat, one of our long time WWM massage therapists, dismantling and cleaning up the space that has held our chair massage station for many years. Since I first made the announcement that WFM Gold Coast Store Team Leader had asked us to close our booth, I’ve had many calls and emails from concerned clients that are sad and worried about our booth closing. Sadly, WWM had no control over whether we would leave the WFM Gold Coast store. If it was up to WWM, we would have stayed open at this location, but like many Chicago institutions, our time was over. WFM Gold Coast leadership wanted to bring more cafe seating into the space we occupied. As Najat would say, C’est Le Vie. What took 15 years to build, we knocked down in hours! I’ve heard wonderful stories from clients that have visited us in the Gold Coast location for many years. One client credits his newfound health and heart improvement on regular chair massage by WWM massage therapists. He said his doctors are surprised at his recovery and tell him to keep the massages up! Another client told me she has used our massage services for 11-12 years and worries she will not be able to travel to our Lincoln Park location for massages once we closed our booths. No more WWM at WFM Gold Coast-WWM has left the building on 1-31-17! We apologize to customers that found our Gold Coast location convenient and are unable to travel to our Lincoln Park location. WWM would be happy to reopen in another location in the River North or Gold Coast or Streeterville area if we can find a good arrangement. We have looked at other potential locations, but thus far, have not had any promising offers for another space for our booth. Unfortunately chair massage is not lucrative enough for us to afford the high rent of Gold Coast office space for a chair massage station. Our partnership with WFM, which has long been a company committed to whole body and wellness, has been a natural relationship. And one we happily continue with WFM Lincoln Park! For those clients of our WWM chair massage booth in the Gold Coast, we say thank you for stopping by and getting massages, sharing your lives, your pain, your joy and your stories through the years. You have touched each and every one of us emotionally, as we have touched your muscles and helped relieve your tension and deal with stress! WWM Previous booth space inside WFM Gold Coast after 2-1-17. Two high top tables replace previous massage oasis. C’est le vie! One of the many reasons I enjoy having a small business inside Whole Foods Market-Lincoln Park is the support of the store management and team members. From the very first day I started managing the massage booth in the Lincoln Park store, my staff and I have felt welcomed and appreciated by Whole Foods Team Leaders (aka managers) and Team Members (aka staff). Whenever I see Rich Howley, the Store Team Leader, as he stacks shelves, speaks with shoppers, encourages his team and overall keeps the new store well stocked, well-managed and well run, I feel Working Well Massage is part of something really special. I know Rich cares about his store and wants to give shoppers a great place to shop, hang out and even get a great massage. And Team Members are super helpful to shoppers, upbeat and happy to have us in the store and get a massage when they can as well. Recently Rich suggested we relocate our massage station about 20 feet from our previous location to give us a solid wall behind our booth and make us easier to find on the main floor. We’ve been located next to the Express lane and many shoppers get confused as to which “lane” to enter: the massage booth or the Express lane. By relocating our booth closer to the staircase leading up to the Mezzanine, we are out of the direct flow of checkout traffic, we have a quieter, more private space for massage and we have more room for our clients coats and carts near our booth. Once again, Rich was looking out for Whole Foods shoppers as well as Working Well Massage clients and massage therapists. So we moved our booth and are so happy with our new location! Now some of our clients are a little confused about where we are now. Even though we did not move very far from our previous location, people are creatures of habit, and have a hard time with change. Hopefully this blog post will clear things up! New Working Well Massage-Lincoln Park Location. Image by Sue Shekut. Old Working Well Massage-Lincoln Park Location. Image by Sue Shekut. The Lincoln Park Whole Foods Market, for the uninitiated, is a 75,000 square foot space and one of the 3 largest Whole Foods Markets in the country. Our Working Well Massage station is located behind the Express Checkout lanes and next to the in store restaurant area (aka the “grocer-ant”). Shoppers can buy deli meat, grab a quick bite from the salad bar or hot food bar, or eat at one of the in store restaurants, and then get a great chair massage. OR, they often get a muscle tension reducing massage, then shop and eat. With free wireless internet at Whole Foods Market Lincoln Park, many of my friends and clients spend hours sitting on their computers, having meetings with their own clients or friends, and people watching far above our booth. I’m not trying to write a Whole Foods brochure here, but for those that have not yet visited Whole Foods in Lincoln Park, you are so missing an amazing shopping experience. Plus a wine bar and a beer/coffee bar! Even a trail mix bar, bath salt bar and Gelato bar too. Stop by our new booth and meet Dennis, Heidi, Mysti, Kimosha, Cindy, Andrew, Yuriy or Robert Ertel. They are all fantastic massage therapists with their own unique massage styles. But they all have one thing in common: They give some of the best massages in Chicago and are part of the Working Well Massage team!